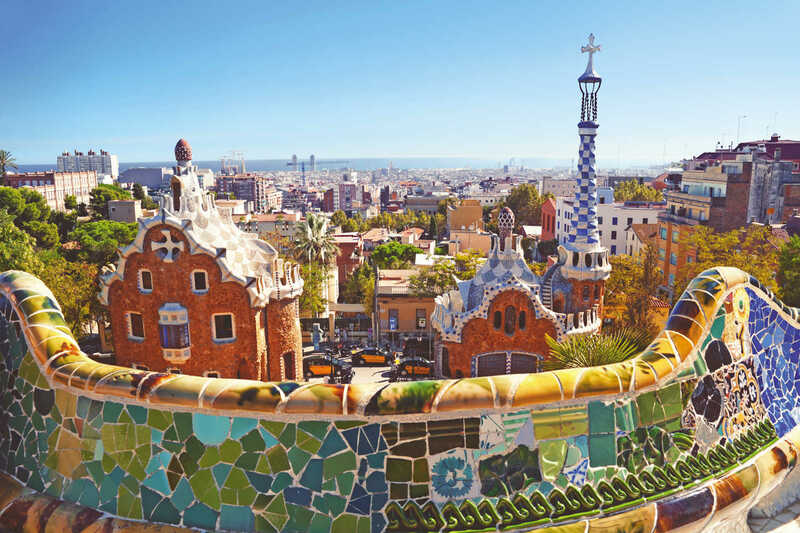 The capital of Spain’s Catalonia region is a city full of coastal charm, UNESCO World Heritage Sites, food credentials and the fantastical architectural works of Antoni Gaudí. Here’s how to make the most of a 48 hour city break to Barcelona. Barcelona is a city that is synonymous with Antoni Gaudí, the world-famous Spanish architect hailing from Catalonia. Known for his truly original style, the majority of his works are found in Barcelona, meaning a stroll through the city is also an insight into the life and character into the man himself. 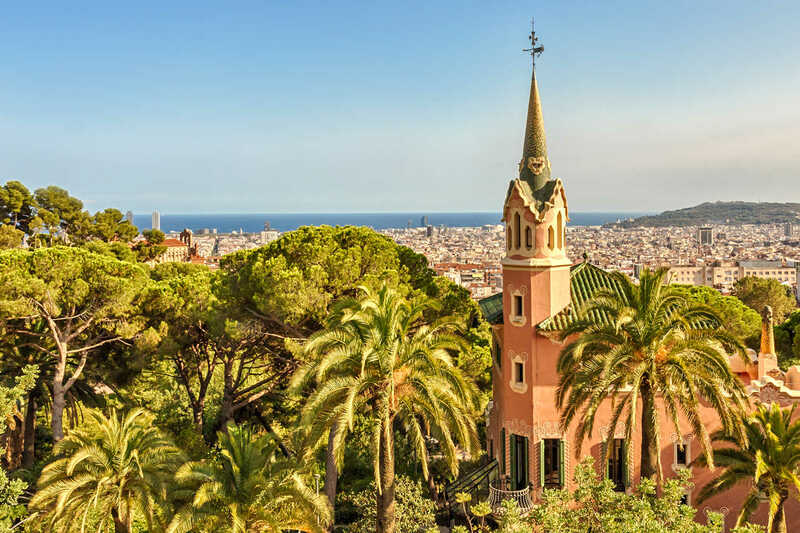 With this in mind, make Park Güell your first stop in the city. This is one of Gaudí’s many creations in Barcelona, and is a park on a hill with gardens and unusual architectural elements. Declared a UNESCO World Heritage Site in 1984, the park also offers immense views over the city. The Monumental Core of Park Güell – where Gaudí’s designs are found – is open daily between 08:00 and 20:30, with closing times varying depending on the time of year. The standard price of entry is €8,50 – book tickets online in advance for a €1 discount and to avoid queuing on the day. While you’re in the park, don’t miss out on visiting the Gaudí House Museum. Gaudí lived here for more than 20 years in the early 1900s, and his former home is now a museum filled with furniture and architectural creations he designed. Spend a couple of hours in Park Güell and the Gaudí House Museum for an insightful first morning in Barcelona. The Gaudí House Museum is open daily 10:00 to 18:00 (October to March) or 09:00 to 20:00 (April to September). The standard price of entry is €5,50 – book tickets online in advance to avoid queuing on the day. Continue the Gaudí theme of the morning by catching the Metro from Vallcarca to Passeig de Gràcia – a ten minute journey that will take you to one of Gaudí’s widely hailed masterpieces. Capturing his signature Art Nouveau style, the modernist Casa Batlló is another UNESCO World Heritage Site in Barcelona. A building set over several stories, Casa Batlló has irregularly shaped windows, sculpted stone work and is covered in a mosaic of broken ceramic tiles, while the arched roof has been likened to a dragon’s back. Admire the building from the outside, or delve deeper and spend an hour inside too. Casa Batlló is open daily from 09:00 to 21:00 – the standard price of entry is €24,50. After immersing yourself in all things Gaudí for the morning, it’s time to discover a different side of the city by making your way to the Gothic Quarter. Either catch the Metro from Passeig de Gràcia to Jaume I in five minutes, or enjoy a 20 minute stroll to the Gothic Quarter along some of Barcelona’s most iconic streets, passing Plaça de Catalunya on the way – considered to be the centre of the modern city and the edge of the old city. 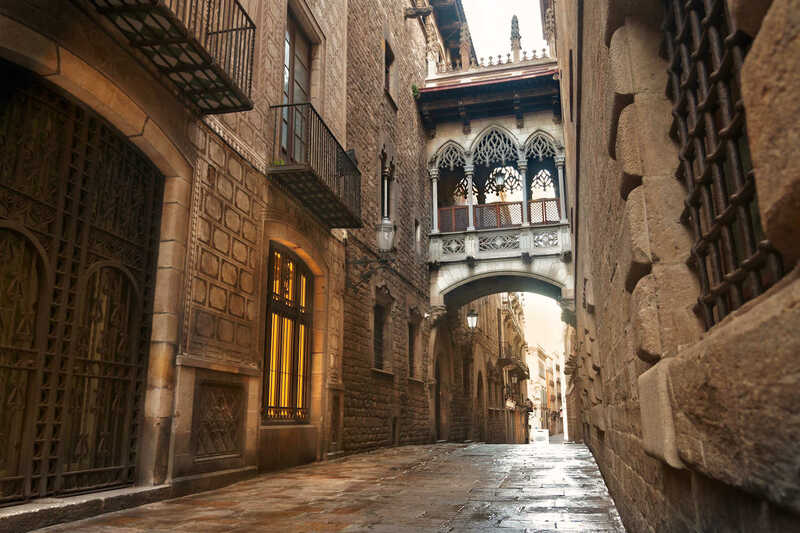 The Gothic Quarter is filled with narrow medieval streets perfect for getting lost in and making your own discoveries. Stop for a late lunch first before exploring. This is the ideal place to find rustic little wine and tapas bars such as Bodega La Palma, where you can enjoy local specialities surrounded by wine barrels. Or stop at one of the many Catalonian restaurants here and eat a paella lunch, as the locals enjoy doing. Try the fideua – a local paella speciality that uses noodles instead of rice, or choose the arroz negra – a black rice coloured with squid ink. Bodega La Palma is open Monday to Saturday, 12:00 to 00:00. If you’re not tempted to slope off as the locals do after lunch for an afternoon siesta, take the opportunity to explore the Gothic Quarter properly. Stop at the picturesque square of Plaça Reial – where Gaudí designed the street lamps, visit the Gothic cathedral called Barcelona Cathedral – which was built over 200 years between the 13th and 15th centuries, and visit the Temple of Augustus – a Roman temple dedicated to Caesar Augustus. It’s easy to while away two to three hours in this part of the city. 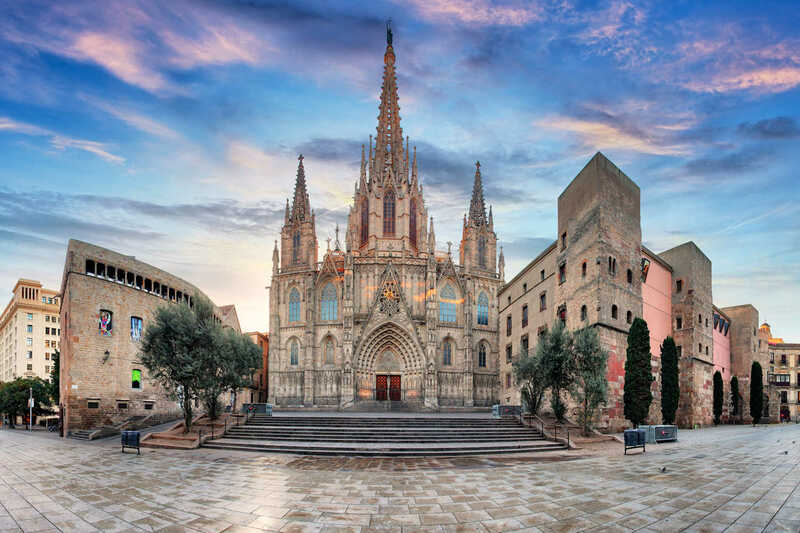 The Barcelona Cathedral is open to visitors Monday to Friday from 12:30 to 19:45, Saturdays from 12:30 to 17:30 and Sundays from 14:00 to 17:30. Standard entry costs €3, with an additional cost of €3 to visit the cathedral’s roof. The Temple of Augustus is open Tuesday to Saturday from 10:00 to 19:00 and Sundays from 10:00 to 14:00. Entry is free of charge. After relaxing in your hotel before dinner, head out for an evening meal filled with gastronomic delights. Barcelona has a number of Michelin star restaurants, and Lasarte Restaurant by Martín Berasategui has an astounding three Michelin stars. Expect a culinary journey around the world with plenty of Catalonian ingredients. Other Michelin star restaurants in Barcelona include The Enoteca, Gaig and Neichel. Lasarte Restaurant is open Tuesday to Saturday, 13:30 to 15:00 and 20:30 to 22:00. 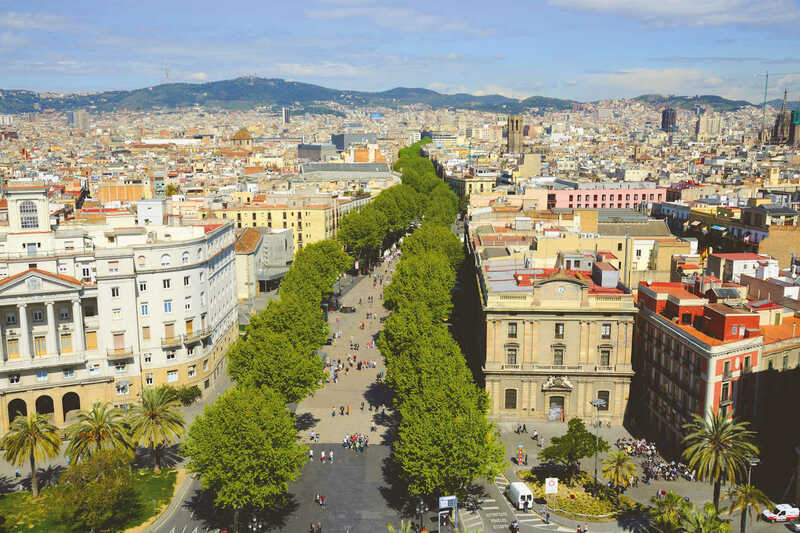 You can’t visit Barcelona without having a stroll along the iconic Las Ramblas – the most famous boulevard in the city. Join locals and visitors alike for a post-dinner walk along this lively promenade, and stop at a pavement café for a carajillo – coffee with shot of alcohol – if it takes your fancy. Start your second day in Barcelona with a breath of sea air. 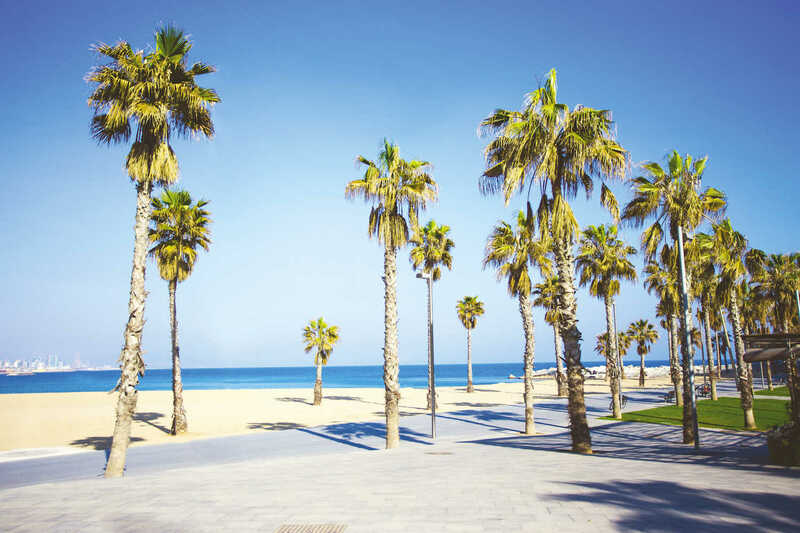 The palm-tree lined promenade by the beach in the neighbourhood known as La Barceloneta is a positively refreshing place to start the day. After enjoying a 30 minute walk and a coffee, either spend an hour getting a bird’s eye view of Barcelona from the Port Cable Car, or continue along to Port Vell to stroll past the luxury yachts and do a spot of craft shopping in the small shops in the locality. The Port Cable Car is open daily between approximately 10:30 and 20:00, depending on the time of year. A round trip costs €16,50. From La Barceloneta, catch the Metro to Jaume I – which just takes a minute or two – and make your way to La Boqueria market. 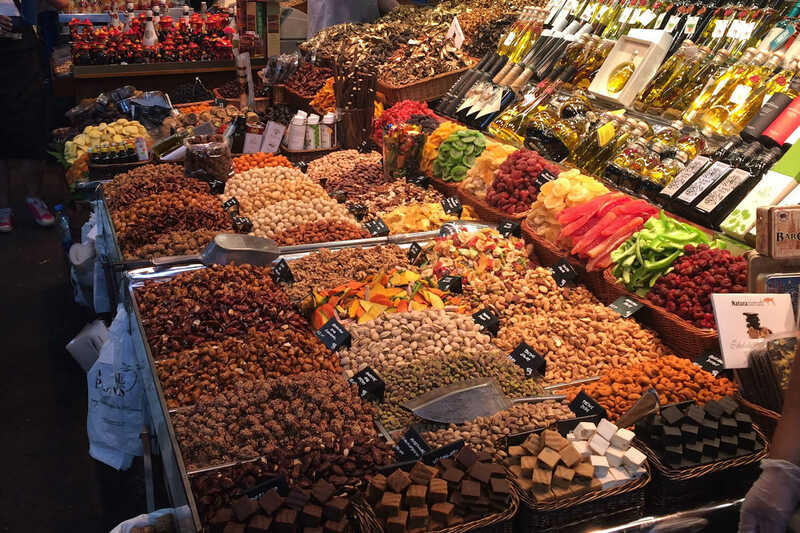 This huge market attracts locals and visitors alike, selling everything from fresh fruit as well as chocolates and spices. It’s the ideal spot to soak up the atmosphere of a local Barcelona tradition for an hour. Either stop at one of the market’s many tapas bars for lunch, or catch the Metro from nearby Liceu to Passeig de Gràcia, which takes just five minutes. Here you’ll discover Tapas, 24 on Calle Diputació. This tapas bar is one of the eateries by the ex-elBulli chef, Albert Adrià, and promises Spanish classics with expert flair. The tapas bar also serves a must-try vermouth – which will give you a taste of the revived vermouth scene in Barcelona too. La Boqueria market is open Monday to Saturday, 08:00 to 20:30. Tapas, 24 is open daily from 9:00 to 00:00. After lunch, make your way to the charming El Born district of the city by catching the Metro from Passeig de Gràcia to Jaume I – a journey that takes five minutes. Soak up the feeling of this picturesque part of the city, enjoy shopping in some of the artisan stores and explore some of the many attractions in the locality. 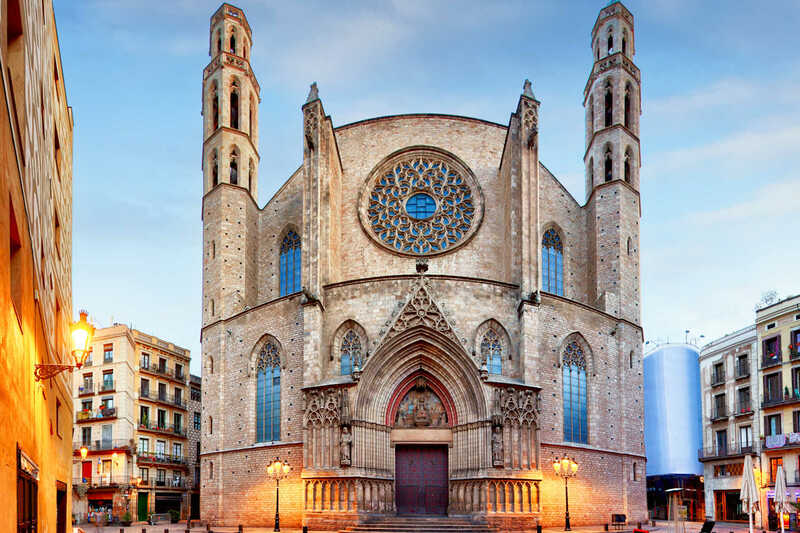 This includes the 14th century Santa Maria Basilica in the Catalan Gothic Style. The Born Cultural Centre is found in an impressive former market building and has various 18th century ruins on display. The Picasso Museum has one of the most extensive collections of the famous artist’s works, with more than 4,000 pieces on display. Spend an hour at each attraction or choose one and immerse yourself in the environment for a few hours. The Santa Maria Basilica is open Monday to Saturday, 09:00 to 13:00 and 17:00 to 20:30, and Sundays from 10:00 to 14:00 and 17:00 to 20:00. Tours cost €10 and last one hour. The Born Cultural Centre is open Tuesday to Sunday, 10:00 to 19:00. Entry is free of charge, or a guided tour costs €5,50. The Picasso Museum is open on Mondays from 10:00 to 17:00, Thursdays 09:00 to 21:30 and every other day from 09:00 to 21:00. The standard cost of entry is €12 and there are a limited number of tickets available per day, so book in advance online to avoid disappointment. Make your final stop of the afternoon the Sagrada Familia Cathedral, by catching the Metro from Jaume I to Verdaguer in just five minutes. 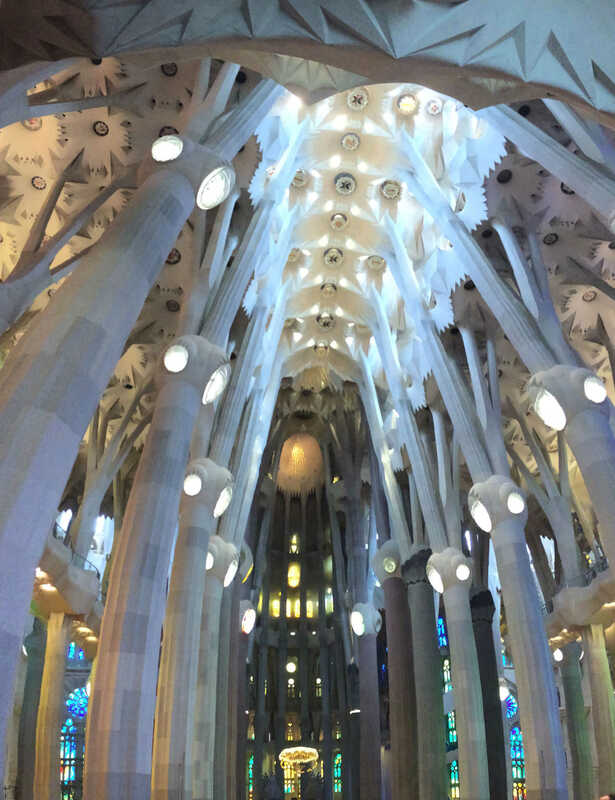 This cathedral is another of Gaudí’s works that is also a UNESCO World Heritage Site, but it is also an unfinished building. Construction continues thanks to public donations and is currently projected to be completed in 2026. This is a fascinating place to explore and a must-visit for architecture and history fans. The Sagrada Familia Cathedral is open daily between 09:00 and 20:00, with closing times varying depending on the time of year. A standard ticket costs €15, or a ticket to the towers to enjoy views of Barcelona too costs €29. After relaxing in your hotel, make your way to Plaça Reial for the evening. This famous city centre square comes to life at night, making it a vibrant place to enjoy a final evening in Barcelona. Choose from one of the square’s many restaurants to enjoy a traditional Catalonian meal while soaking up the atmosphere of the locality. Afterwards, make your way to the Jamborree Jazz Club, also located on the square. This music venue became famous in Spain in the 1960s for its jazz performances, and remains a must-visit location to this day for jazz music fans. The Jamboree Jazz Club is open daily for two performances every day at 21:00 and 23:00. Tickets cost €12.